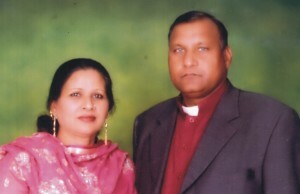 Biography: United Protestant Church of Pakistan was started in 1996 with the mission to welcome all people to the worship of Almighty God, where the redeeming love of our Lord Jesus Christ is preached in a spirit of Christian fellowship and love, extending into our community and to the world. The vision of the ministry is evangelization of all people and uniting small independent churches, training, and ordaining the untrained pastors. The ministry also focuses on marriage and women's ministry. Emanuel tells us, "Pakistan is a Muslim country and it is difficult for a man to evangelize women." The ministry also has Lord's Bible College and Seminary to train men and women for ministry, and is open to people of all denominational backgrounds. Evangelism projects include visiting families and arranging worship in different areas. They have a plan to establish Lord's Cambridge School in Rawat in the future. Strengths: Emanuel and Zareena Naz are relational, able to approach nominal Christians and evangelize through social activities. Emanuel is a gifted teacher and preacher. Family:Emanuel and Zareena Naz have six adult children, Shahmiala Sonia, Niala, Irfan, Siaka, Noreen and Maria.